This week we have a review of the latest mystery by Annamaria Alfieri, Strange Gods, along with an interesting interview with Annamaria. At the end of this post are details on how to win a copy of Strange Gods, and there is a link to purchase the book-a portion of sales goes to help support KRL. Vera McIntosh, raised in Africa, is the daughter of Scottish missionaries. Justin Tolliver is in the limbo position of an aristocratic second son, now working in the veld below his station as law enforcement. Kwai Libazo is part Kikuyu, part Maasai and part of the white man’s world by wearing a British law enforcement uniform. What do these three people have in common? Each has a foot in two worlds and feels like a stranger to both. This is the rising composite of Africa, circa early 1900s. The Dark Continent is being civilized by the Brits, who, in their fashion of colonization, ignore the customs of the locals and remain ignorant of the land they occupy. When Vera’s uncle is found dead in the coffee fields with a spear in his back, the hackles of the colonists are raised. Tolliver’s superior officer is on leave in England and he is called in to handle the case. In this instance, it means pinning the murder on any native with a grievance. The problem is, Tolliver believes he is supposed to demonstrate the English justice system and find evidence. Vera and Tolliver have circled each other socially for some time. In the limited number of singles available for marriage among the British, Vera and Tolliver have circled each other socially for some time, each recognizing a kindred spirit. It’s hard for Vera to play the proper Scottish woman and Tolliver can’t tell her that it’s her love of Africa that has overcome his heart. He, too, loves his adopted country. The murder investigation brings them together as they both try to protect the Kikuyu medicine man. The physician had much better medicine. The medicine man was losing patients—and face. Other than a few curses, there is no evidence, especially since the spear wasn’t even a Kikuyu spear. It belongs to the Maasai tribe. No reputable medicine man would use a taboo weapon. Tell that to Tolliver’s boss and the rest of the colonists. All they want is a speedy trial and execution. Solving the murder becomes a race against time for Vera and Tolliver, with the help and native insights of Libazo. It becomes a literal race across the plains of Africa as all three seek to stop a safari party where the real killer may be hiding. Alfieri’s novel brings Africa to Technicolor life. If you don’t have the urge to re-watch Out of Africa with Robert Redford and Meryl Streep after reading Strange Gods, your sense of discovery needs to be resuscitated. Annamaria: I wanted to be a novelist when I was nine years old. But I was born in the working class city of Paterson, New Jersey at a time when its industries were approaching moribund. My schoolmates and I did not aspire to be artists. We wanted to go to college (something almost none of our parents had done) and then get a good job so we could get out of there. Most of us did. During my career as a management development consultant, I wrote nonfiction books having to do with my work, but my dream of being a novelist never left me. In the late nineties, I gave up a demanding consulting career and became the CEO of a small marketing company. Freed from the daunting schedule of international business travel, I started to write fiction in earnest. Throughout my life, I gleaned a great deal of satisfaction from my “day jobs.” But no other work I have done required as much from me or gave me as much satisfaction as writing fiction. KRL: When did your first novel come out? What was it called, and can you tell us a little about it? Annamaria:City of Silver came out in 2009. It is a locked-room mystery that takes place in Potosí, in the Spanish Viceroyalty of Peru in 1650. In what was at that time, the richest city in the world and the largest city in the Western Hemisphere, the daughter of the town’s most powerful citizen dies under mysterious circumstances inside the walls of cloistered convent, putting the Abbess on the wrong side of the Inquisition. The nuns of the convent, their Jesuit confessor, and one of their young postulants must solve the murder to save the Abbess’s life. 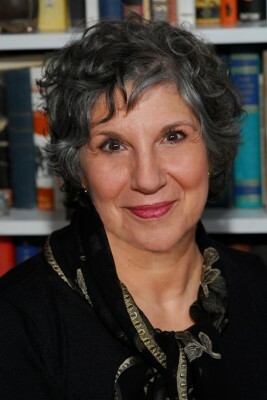 Annamaria:All my practice novels and all my published books are mystery/suspense and all the published mysteries are “historicals.” I also have five published nonfiction books–all on business subjects. They came out under my legal name Patricia King. The first three were on technical aspects of management. The last two were more popular advice books. One of them, Never Work for a Jerk, landed me on the Oprah Winfrey Show. KRL: That’s really cool. What brought you to choose the setting and characters in your latest book/series? Can you tell us a little about the setting and main character for your most recent book? Annamaria:My latest, Strange Gods, is the first of a series. The previous three are all stand “alones” and are set in different places and times of South American history. This new one is my first in Africa. It takes place in British East Africa (now Kenya) in 1911. I have been fascinated with this time and place since I read Out of Africa in my late teens. After a couple of splendid visits to sub-Saharan Africa, I became infatuated with the African wilderness. When I decided it was time to tackle a series, I could not imagine a more wonderful place to inhabit in my imagination. There are three series characters. Justin Tolliver, an Assistant Superintendent of Police, is idealistic and bright but in the first book somewhat naïve about African ways. He is the impecunious second son of an Earl and joins the police force because he wants to be in Africa, to serve his country, and to have some adventure. He soon finds that the work he does satisfies something deeper in him. Vera McIntosh, the daughter of a Scottish missionary, was born in Africa and raised with black African children by a Kikuyu nanny. Her uncle is the murder victim in Strange Gods. Kwai Libazo, Tolliver’s top African lieutenant is half-Kikuyu and half-Maasai, rejected by both tribes. He is conflicted in that his allegiance is now supposed to be to the Brits and Tolliver, but his instincts are those of an African tribesman. Annamaria:I am a storyteller. Nothing is more important to me than telling a fascinating yarn. So as far as I can, I try to make sure nothing else gets in the way of that. But what fascinates me is faraway places and what it was like to live in them in the past. Not the geopolitics. I leave that to the historians. I want to know what it felt like to the people who lived there and then. I aim my research at learning enough to recreate that feeling. As a reader, even though I read for entertainment, I like to learn something new. So my goal as a writer is to weave the history and the characterization tightly into a story that moves along and keeps the pages turning. Annamaria:I write just about every day. I set myself goals of a number of words. I don’t always make my goal, but I try, and I watch my progress over time. Many writers report that it is a struggle for them to write, torture every time they do it. I am fortunate not to be one of those. As least not so far. When my head is in my story, nothing else about my life bothers me at all. I am gone away. For me, that state is addictive. Annamaria:I am a “pantser.” I have tried to force myself to outline, but once I start to think deeply about the story and it starts to happen in my head, I have to start writing it. At the outset, I think I know the theme, the main characters, the victim, and the suspects. As the story unfolds, things start to change. That sometimes scares me, but I go where the story takes me. The great E.L. Doctorow described this way of writing fiction as like driving in a thick fog with your headlights on. You can’t see very far ahead, but you can make the whole trip that way. Annamaria:I ordinarily work for some hours between 10 a.m. and 4 p.m. By habit, this has become my most energetic time. Annamaria:Breaking in as a fiction writer was daunting in the extreme. As I said above, I wanted to be a novelist when I was nine years old. In my fifties, after I had published four nonfiction books having to do with my career as a management consultant, I began to concentrate on fiction with some determination. I studied, joined a writers’ group, and wrote five practice novels, all contemporary woman-in-jeopardy thrillers; that’s what I thought I was going to write. The fifth was left unfinished because during a vacation I had fallen in love with a piece of South American history, a time and place that spoke to me of intrigue and romance. Potosi’s history and physical beauty took over my imagination. The result was a story that FINALLY looked worthy of publication. Over the next eight years, only one of the hundred or so agents I had queried agreed to read my manuscript. He liked it very much, but he wanted me to turn it from a story where women band together to solve the mystery into one where the priest acts as an amateur detective and charges in to save the day. Having a man rush in to save all the women is not a likely theme for a woman such as me. I turned that agent down and went on with my queries. By year eight, the supply of agents I could approach was drying up. Then a friend from Mystery Writers of America called me to say he had met the perfect agent for me. He gave me her contact information. I wrote it down on a post-it and stuck it to my desk, but I dreaded another rejection or, more likely, being ignored. Then, a new strategy occurred to me. My last nonfiction book–Never Work for a Jerk–had been published in three English editions and a few foreign languages. It had landed me on Oprah more than a decade before, but still. Instead of my query letter about my novel, I sent that agent a description of a sequel to Never Work for a Jerk–Monster Boss. I kissed the envelope and dropped it the mail. The very next day, she called me and asked some very pointed questions. Then she invited me to lunch, at the end of which, she told me she could sell that book. She did. Then I had to write it. Once the manuscript for Monster Boss was delivered, she sent me a check for the advance on royalties with a post-it on it that said, “What next?” I sent her an email telling her that I had a novel. She called and in a voice she would have used it I asked her to give up chocolate, she said, “I didn’t know you wrote fiction.” I described City of Silver. With a deep sigh, she agreed to read the first thirty pages. The email with them went out in nano-seconds. The next morning, she called to ask if the book was done. “Yes, it is,” I said. Once she read it and sent it out, it sold in four days. KRL: What a great story. What are your future writing goals? Annamaria:I am concentrating on the African series right now. It will be ten books, following themes of the Ten Commandments. But I have another idea for a South American stand-alone, and one for another series that will take place in Italy. As long as I can type or hold a pen I will keep writing. Annamaria:My heroes are many: the number one William Shakespeare, closely followed by Jane Austen. Gabriel Garcia Marquez was a god to me. Of my contemporary historical mystery writers, I love the works of Ann Perry and Charles Todd. Annamaria:TONS!! I mostly like to read eyewitness accounts of the time and place of my setting. I have the enormous privilege of being a writer in residence at the great New York Public Library Steven Schwarzman Building, that gorgeous marble temple of free knowledge at Fifth Avenue and Forty-second Street. I could not write the books I do without its unparalleled collection. Annamaria:About 30 or 40 books of research for every book I write. For pure fun, lots of mysteries, concentrating on those by my friends and blogmates. A classic or two every year–rereading Jane Austen, Dickens, Mark Twain. Short stories on the subway. I am compulsive. When walk from one place to another, I listen to audio books. Annamaria:I don’t watch any broadcast TV, except for PBS Masterpiece, but I am a Netflix addict. I watch TV shows by streaming them in binges. I love to watch a movie I enjoy over and over. Of course, I know every frame of Sidney Pollack’s Out of Africa by heart. But I like to watch classic movies too. I would not miss one second of Downton Abbey, even though sometimes Fellows makes me mad with his plot choices. I could go on and on talking movies. Annamaria:My motto is Labor Omnia Vincit–work conquers all. Work hard. Go over your work and over it till it sings to you. And NEVER give up. KRL: How do you feel about the growing popularity of e-books? Annamaria:I read in all formats. The format is not what’s important. It’s the story that counts. I do worry over what e-publishing has done to the income of publishers and authors. Annamaria:Just to say thank you so much for this opportunity. KRL: Thank you for taking the time to chat with us. What is something people would be surprised to know about you? Annamaria:I once worked as a magician’s assistant. KRL: How do you compete in an overcrowded market? Annamaria: It is difficult for all mid-list writers like me. I arrange signings at bookstores and presentations at libraries. I share two blogs with other writers and do blog tours. I go to the mystery conferences, like Bouchercon, Left Coast Crime, Malice Domestic, ThrillerFest. I participate in social media. I am a member of Mystery Writers of America, which gives me opportunities to appear on panels and do readings with my fellow MWAers. I spend some time almost every day trying to do something that draw attention to the books. Your word “overcrowded” is very apt in describing the market. But there is also the issue of the changing publishing landscape and the inability of publishers to be able to predict their own futures with any certainty. That makes them cautious, understandably so. They bet their promotion budgets on sure things–writers who are already well-known. I understand the business sense behind those decisions. I write the best books I can and then I do what makes sense trying to make their existence known. And then I go back to the keyboard with my fingers crossed. 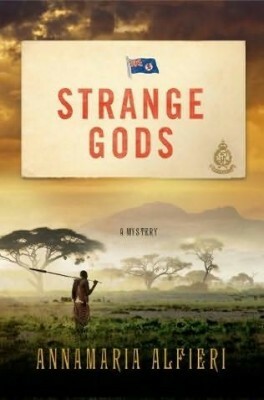 To enter to win a copy of Strange Gods, simply email KRL at krlcontests@gmail[dot]com by replacing the [dot] with a period, and with the subject line “Strange,” or comment on this article. A winner will be chosen June 28, 2014. U.S. residents only. Annamarie: I admire your tenacity in pursuing publishing until it happened for you. So happy for your success. Your book sounds fascinating. Lots of luck with your future efforts. Your books sound fantastic, and I’ll be adding them to my TBR list. The cover of Strange Gods is beautiful! Best wishes! Is there a more fascinating place than Africa, especially in this time period? Throw in a mystery and it’s going on my TBR list for sure. I would love to read about a love of Africa and all the wonderful things I would learn. The entire continent is filled with mystery and adventure and beautiful things and creatures to see. The compelling review Sunny wrote describes a book with interesting characters, a complicated plot full of romance and mystery, and a setting that I bet the reader will hear, see, and feel. Being on Oprah is always impressive, but I was awed by the research Annamaria does before writing a book. And when a book is in a series, I always want to read the first book in the series first. Since Strange Gods starts her series, there won’t be any catching up to do, only waiting for each addition to the series to come out. Great review, Sunny, and a very good interview, Annamaria. Sunny, you have made the novel sound irresistible. Thanks for bringing this author to our attention. Like you I love PBS and am a Netfilcks addict. Years ago I was in Kenya on a wildlife management safari. It was the trip of a lifetime and no other travel adventure has quite lived up to the people I met there or the land and animals. I think I’m going to love your book. Your post is captivating and this book would be memorable. Thank you all so much for your lovely comments. So encouraging. And so in synch with my own feelings for that time and place. It is lovely to meet so many kindred spirits! Annamaria, I love your passion! For writing, for Africa, for life! wow! Thanks for all the info on the author and the book, great interview! Joe, I am glad the strength of my feelings comes through. I powered through a lot of disappointment and waited a long time to realize this dream. You are right. I am reveling in it. Thank you, Lynn, for your kind words. A book will go out to her in a few days! I hope she enjoys it.